One trend I really don't mind seeing is game genres taking place in outer space. Once the sole property of sci-fi releases, just about any title can relocate to the middle of the black without having to slap a science fiction label on the cover. Rogue Continuum keeps the tradition going with a cooperative roguelike planet-crawler shmup that just hit Steam Early Access. The basic idea in Rogue Continuum (previously known as Space Sluggers) is you play a borderline psychopath who travels back in time to prevent the destruction of Earth by killing all of the aliens. Yes, all of them. Tons of weapons, plenty of environments, loads of baddies to shoot, that sort of thing. 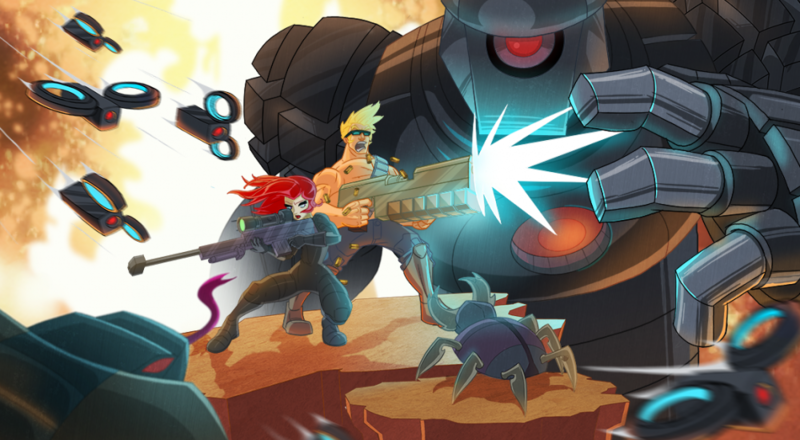 Join forces with three friends to kill even more of all of the aliens, all with a persistent progression system and characters with unique special abilities. Come on, how does that not sound like fun? Ok, I'll admit it. Rogue Continuum is a sci-fi shooter. For some reason it doesn't seem like one, though. What with its focus on insane protagonists and crazy over-the-top co-op action. Rogue Continuum only features local multiplayer for the time being. Regular updates are planned now that it's hit Early Access, and one of those updates will add online multiplayer. The full release for PC and consoles is planned for 2016. Page created in 1.1144 seconds.